In The Serger’s Technique Bible, author Julia Hinks walks you through every step of the serging process, from setting up your machine to the best techniques. If you’re new to serging, this is one of the most complete guides I’ve ever found on the subject. But even if you’ve been serging for a while, you’ll pick up tips and tricks in this book that will help you improve your craft. Is this a book you should have on your bookshelf? Yes – if you’re serious about learning how to use your serger. Let’s dive deeper into this book to see what it has to offer. Whenever I look at buying a new book on anything – but especially with sewing or quilting – I always do my research on the author (if I don’t know him or her too well). I was pretty familiar with Julia already, as I followed the “Sewing Tips” section on her website. For those of you who’ve never heard of her, Julia is an expert seamstress, crocheter, and knitter. She learned her crafts from her mother and grandmother when she was young, and has been crafting ever since. She also teaches dressmaking classes at Brighton’s City College and courses at the Fashion & Dressmaking center. She teaches private lessons, and she provides knitting, crocheting and alteration services. The Serger’s Technique Bible is the first book she’s authored, and it’s now available in several languages. As you can see, Julia is well-qualified to write this book. She has a passion and a gift for teaching a craft she knows and loves. Julia’s writing style is friendly, and the entire book is an easy-read. Whether you’re a beginner or you’ve been serging for years, you’ll walk away with new insight, tips and tricks that will help you improve your technique. The Serger’s Technique features stunning color photographs, so you can see what Julia is talking about. For visual learners, the photos in this book go a long way in helping you understand the techniques she’s trying to teach. Along with photos, Julia also includes written step-by-step instructions on just about every stage of the serging process. These are just a few of the topics Julia covers in her book. If you’re looking to learn serging techniques step-by-step, this book will not disappoint. Along with helpful guides, Julia also offers troubleshooting tips to help you correct mistakes or avoid them in the future. There’s a learning curve when using a serger, and even after years of practice, you’ll still make mistakes from time to time. When you do, you can refer to Julia’s guide to help fix the issue and get back on track. These are tips you can refer back to time and time again, no matter how advanced your serging skills are. The Serger’s Technique Bible is broken down into three simple sections, but Julia covers a lot of information in each chapter. The entire book is 128 pages, so she offers plenty of information and expertise. The first chapter covers the basics, including the anatomy of your machine, troubleshooting tips for correcting mistakes, adjusting settings, setting up your machine and the threads you can use with your machine. Julia covers both basic and advanced techniques, so you have new skills to master as you progress in your skill level. At the end of the second chapter, she discusses the different types of feet you can use with the serger sewing machine. The third chapter is the fun part. In this section, Julia walks you through eight fun and simple projects to put your skills to the test. These projects include: quilt, scarf, top, child’s dress, tote bag, tube skirt, drawstring bag and a pillowcase. 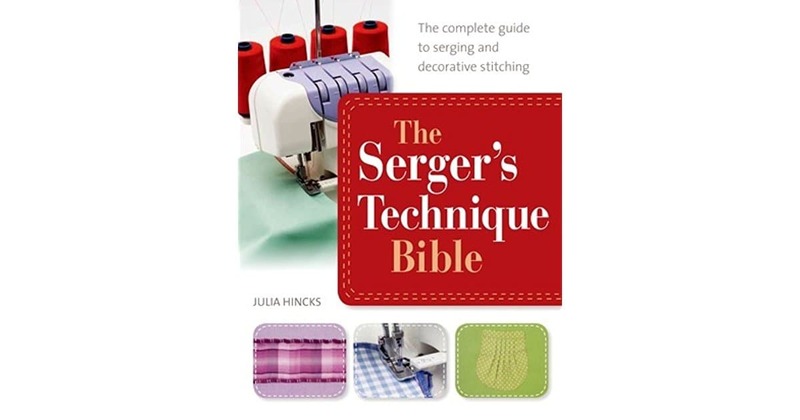 The Serger’s Technique Bible makes a great addition to any seamstress’s bookshelf. From new techniques to troubleshooting and everything in between, seamstresses of all skill levels will learn something new in this book. Click here to get your copy of The Serger’s Technique Bible.